How to make desiccant packs to place them in your Gun safe or in ammo cans? Guns are not only used in hunting they are used in self-defence from intruders. Having a qualified gun safe is the best way to protect your firearms away from the wrong person and also protect you from the gun law. However, as time goes by and the number of firearms you own increases, there are more expensive guns you have, the needs to control rust and corrosion inside your gun safe is very important. Because it is pointless to have an expensive gun safe and your valuable guns are rusting away inside. Let’s me describe a bit about how and when rust and corrosion formed. Rust and corrosion is formed by the effecting from the corroding agents such as humidity, moisture from the air, salts, sulphur dioxide, ammonia or acid rain resulted from the surrounding environments, etc. When a corroding agent (or we can call it an electrolyte – oxygen, moisture or humidity) is presented on the surface of a metal that is when corrosion begins. The corrosion process happens in the formation of oxidation on the metal surface. When this happens, through the corroding agents forming in a loop, the electrons then flow from areas with high-energy of the metal to the areas of low energy. This is why accidentally we can see some metal surfaces having nicks and scratches. That is when rust or corrosion is forming. The rust or corrosion prevention methods I listed out below will stop this reaction by unreactive the surface and inhibiting the electro-chemical process that provokes oxidation. Thus, controlling humidity and temperature inside your gun safe is vitally important. Before looking into each protection option, let’s first consider the two simple initial steps in the war against rust and corrosion. First, seals – if your gun safe doesn’t have one, consider to attach any rubber types of seals all around the door of your safe in full length strips. This will block away moisture, humidity from the air in the environment outside the safe from entering into the safe. Secondly, rust preventative – consider to coat your firearms with a quality and long-lasting rust preventative. 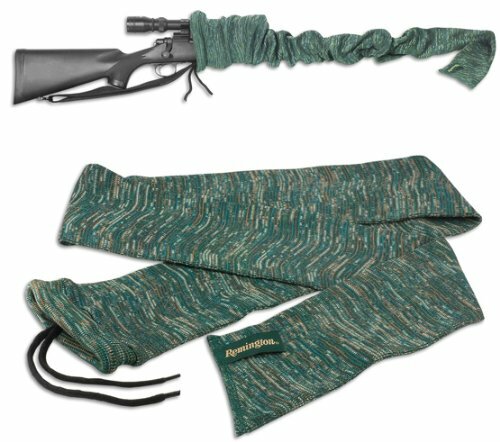 This will protect your firearms from directly absorbing moist air which will gradually oxidize the metal parts of your firearm and become rust over the time. Some types of rust coating preventative will leave a glossy dried film layer which acts as a barrier after the carrier vaporise, and there is no need to remove it when you are using your firearms. After these initial steps, let consider the below options of gun socks, electric warming unit, placing any small or large desiccant packs, or put an anti-corrosion emitter inside your gun safe. Consider get your firearm stowed in gun socks which are exclusively made for protecting guns from rust. Gun socks are made from thick, synthetic fleece fabrics treated with silicon and rust preventative base. The thick fleece fabric absorbing the moisture away from the surface of your firearms and provide effective protection against rust over the time. Another way to prevent Rust and Corrosion is to regulate the temperature inside your gun safe by using an electric warming unit. It will maintain warm air circulate your safe for 24 hours, this can lessen the chance the air become moisture which will gradually form rust in the metal surface of your guns. Placing small and larger desiccant packs at each shelf in your gun safe and handgun drawers or in ammo cans is also a good way to absorb humid and moist from the air inside your gun safe. It comes in handy packs in various different sizes which provide one of the inexpensive rust protection options. You could either make desiccant yourself or get it in bundles from department stores. In case if you store your pistol or other handguns in synthetic foam-lined plastic cases, consider to put one or several small desiccants into the case, so it can wick away any harmful moisture inside. Also, it is nice if your plastic cases are cloth-lined. However, I do not recommend placing your shortguns or Air Rifle into synthetic plastic cases; instead I would recommend you had better put your guns in vacuumed and zipper VCI (Vapour Corrosion Inhibitor) bags. VCI (Vapour Corrosion Inhibitor) – To protect your firearm using this kind of zipper pouch vacuumed is another effective way in anti-corrosion. This pouch is laminated and employs the most two important features of the flexible packaging technology – the impregnated sealant layer and the foil barrier layer. The final finished pouch will have an anti-corrosion barrier material that is non-toxic, non-abrasive, puncture resistant, tear resistant, and will not harm any non-metal surfaces. You can purchase these pouches in online stores. If the bag, pouch is repeatedly opened and closed and vacuumed again, its protective quality can remain for up to 5 years. If the bag or pouch is not opened frequently, the protective quality of the bag can last up to 20 years. They come in different sizes which fit well a handgun, short gun, or as large as a air rifle. The last line of the battle against rust and corrosion is to place an anti-corrosion vapour emitter in your gun safe. They come in strips or self-adhesive cups for small cabinets, which applied the same effective anti-humid and rust formulas used in the military and similar industries. Depending on your gun safe size, you can place one for the whole safe, or stick one at each different position like in some odd-shaped parts, or nooks inside your gun safe. These strips or self-adhesive emitter cups provide continuous corrosion protection for up to two years. Emitter in cups would typically have 2 sizes, small emitter (5 cubic feet) and large emitter (11 cubic feet). You can find them in most department stores or purchase online at Amazon. For bigger gun safe, you can use rust blocker shield emitter whereby you can protect rust for a space in your gun safe as large as 50 cubic feet in one year. Beside desiccant packs, the anti-corrosion emitter or rust blocker shield is another reliable, economical, and convenient way to protect your guns against moisture damage and oxidation formation. Put a desiccant in each shelf and drawers of your gun safe to protect your guns from humidity from the air. It can also be place in ammo cans as an effective way to lock away harmful moisture which can reduce your ammunition quality. How to make it? It is easy to make one. All you need is to get a bag of silica gel, and a small fabric bag. Remember, it’s silica and not silicon. Silica gel is not like gel at all! It looks like white sands and often used to dry flowers or place inside a medicine tablet container to absorb moisture away. So you can find them in most department stores under floral or craft sections. When you ready, just put a coffee spoon or two to the prepared fabric bag and tighten it up so no silica gels are dropped out. You can make larger desiccant bags as desired in a larger size fabric bag with more than just two coffee spoon of silica gel. When you finish, just place the desiccant packs anywhere as you desired in your gun safe to wick the moist and humid air away, and prevent Rust and Corrosion to protect your firearms and valuable gun collections. Not only to get yourself a quality gun safe but also there is a needs to protect firearms from rust and corrosion by applying the protection options I listed out above. The first initial step is to attach any rubber-type of seal strips in full length around your gun safe door to block the air from outside the safe from entering into the safe. Next is to consider coating your firearm with a kind of rust preventative to keep the metal parts of the guns from exposing to humid and moist air. After these steps, you can choose whether to carpet, cloth-lined each shelf, and the drawers in your gun safe, or place desiccant packs/bags also at each shelf and drawers. Alternatively, you can have your guns stowed in a gun sock, or more conveniently, you can put them into gun rugs instead, depending on your budget and your needs. Moreover, to regulate the temperature inside the gun safe, you can use an active electric warming unit to monitor the temperature 24 hours in your gun safe because temperature is up or down provoke moisture and so the formation of rust and corrosion. Finally, you can protect your firearms and ammo cans against rust by an active anti-corrosion emitter or rust blocker shield emitter. Have fun and stay safe hunting!